One of my favorite dishes growing up was Sausage and Peppers. It’s really Sausage with Peppers and Onions but nobody (at least the people I know) ever calls it that. I have so many good memories of eating Sausage and Peppers sandwiches, Sausage and Peppers over rice, over pasta, straight out of the pot and (when I got older) alongside a big salad. Ultimately, this recipe and cookbook inspired me to revive an old family classic but make it new again by adapting my own recipe to work in the slow cooker. This take on Sausage and Peppers is unbelievably easy and smells heavenly as it simmers away all day. I like to serve this over Cauliflower Rice or Zucchini Noodles for some texture. You can easily substitute Chicken or Turkey (Italian) Sausage if you don’t eat Pork. If you use Spicy Sausage, you may want to cut back the crushed red pepper flakes just a bit and add more in at the end if you need to. I used all Green Bell Peppers but any combination of colors would work here! Note that if you leave the sausage in the slow cooker for too long, it can really lose it’s texture and become very soft. This doesn’t bother me for a dish like this, but if texture is a thing for you, keep this in mind. Slow Cooker Sausage and Peppers. 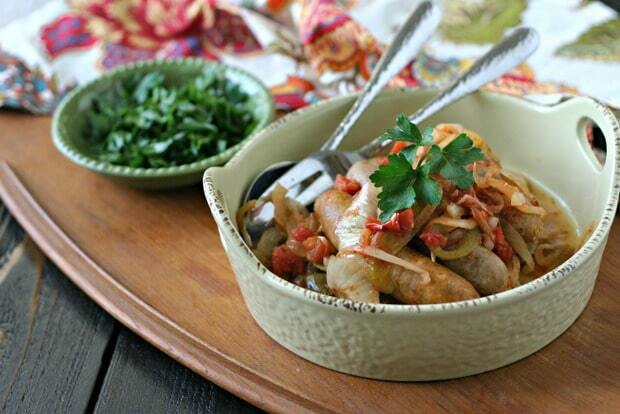 Gluten Free and Paleo Slow Cooker Sausage and Peppers. 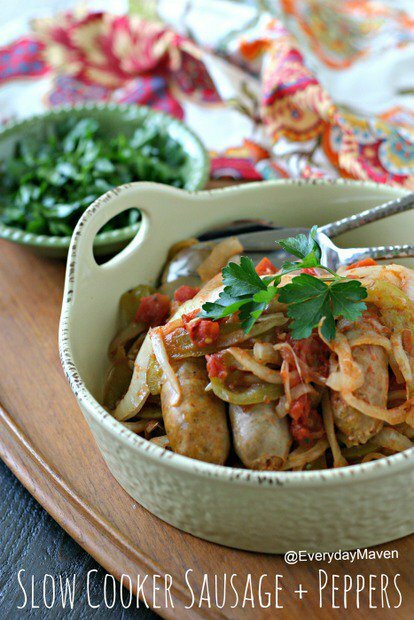 You can substitute Chicken or Turkey Sausage! Finely chop garlic. I used my food processor with the chopping blade to save time. Remove about half of the peppers and onion mixture to a bowl. Bury the uncooked sausages in the middle and return the peppers and onions back to the slow cooker to cover the sausage. Add the bay leaf. Cover, set to low and cook for 6 hours. The onions and peppers will give off a lot of water as they cook which will make the sauce liquid and spoon-able so don't stress that there isn't enough liquid. Top with some chopped parsley, serve hot and Enjoy! This has game day written allllll over it! 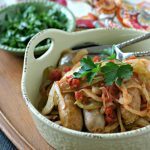 I love crockpot recipes- easy and delicious! Oh yes!! Perfect for game day!! This was delicious but definitely not a low carb meal. 22 net carbs per serving. Not appropriate for Keto, which is the search I did that led me here. Hey Danae – you can modify how much of the onion, pepper and tomato combo you take and reduce the carbs for your plan! While it’s still a little high, you forgot to subtract the fiber to get the net carbs. It’s actually 17 net carbs. This looks awesome and I want to serve it at a gathering I’m hosting soon, but I think I need to double the recipe since it only serves 4. Should I plan on increasing the cooking time if I do this? Nope! The cooking time should stay the same. Also, this makes a LOT of onions and peppers so I wouldn’t necessarily double the veggies – maybe just add an extra pepper and an extra onion but double the sausage! 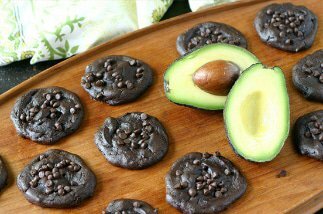 Can you provide the nutritional information for this recipe? Hi Theresa, You can use http://www.MyFitnessPal.com to generate nutritional information for any recipe for free! I’m new to the MyFitnessPal app, how do I get the nutritional information there? Question: hosting a buffet where people would be eating from their laps. Prefer they do not have to cut things as that becomes precarious. What if I cut the sausage into smaller bite-sized medallions? Would that work? Would I need to adjust the time? I would follow the recipe as written and then remove and slice the sausages into rounds before serving. Enjoy! Hey there, this looks absolutely delicious! I’d love to get in on the next Food Blogger Cookbook swap. What do I need to do? Thank you! I did it but it said I’d get an email to confirm my email address and it never came. Should I do it again? Nope Toni – just checked and you are confirmed! 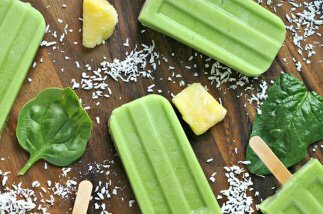 Great recipe, I stumbled upon this on Pinterest. I used a local spicy sausage as suggested and did not cut back on the pepper flakes, It had a perfect amount of heat. 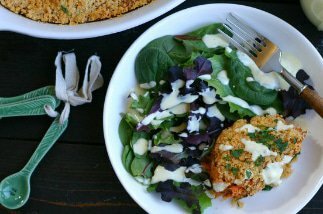 I served it on top of quinoa and it is now one of my favorite easy meals. Question……I prefer no crushed tomatoes. Can I just leave them out or do I need to replace with something for moisture? Thanks. Hi Greg, The tomatoes are pretty important not only for moisture but balance. I am really not sure what this would taste like without them. I think there is too much tomato in this recipe for me, too. Maybe instead of such a big can of crushed tomatoes, some petite cuts would work better. I also cut the sausages into medallions to make the dish s little more eater friendly. Croc-pot started and I cant wait to sit down with the family later to enjoy it. Will let you know how it turns out!. Thank you so much Steve! Your comment made my night and I am so glad you love the recipe. Thanks for taking the time to comment and let me know. Have a great weekend!